Our salt dough creations…just cookie cutters. This is more of a weekend activity, I think. We spent an hour and a half on this activity, including the cleaning up, so I guess you could squeeze it in after work. I have never tried salt dough before, but there are loads of parents out there doing all sorts of wonderful fun salt dough creations. We did not get too adventurous, as this was the first time we tried it. I measure out the dry things and let Honeybear mix it up with a spoon. I added the water and mixed that in. Then we both used our hands to knead the dough. I found it a little sticky, because I did not want to flour the board while working. I added a tablespoon of oil and a little more flour to get a drier, less sticky dough. It turned out great because it does not stick to the cutters and it is not fragile. The dough works up very quickly. I rolled it out and allowed Honeybear to use the cutters to cut out shapes. We had a firm dough, so he was able to help pick them up too. We used a straw to make the holes for us to thread later. Honeybear loved poking the straw in. It was nice, because we both had fun with this. It is not hugely messy, and not too fussy s a toddler is able to participate nicely. Honeybear also ate some of the dough so it was great that we were not using shop bought clay. Honeybear enjoyed the tactile aspect of playing with the dough and creating the pretty shapes. 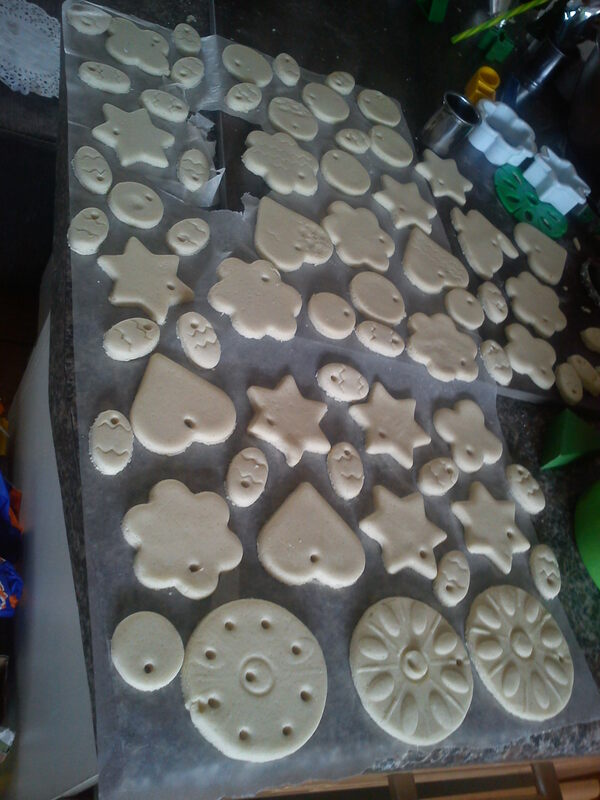 You can dry the shapes in the oven at 180 degrees for 3 hours. We chose to air-dry. It apparently takes two days. I shall update when we have dried ours out. The microwave drying method did not work for us. It just baked and had air bubbles. This activity allows us a second one for painting and a third one for threading. They can spread out and you can paint on maybe two afternoons.